New Delhi: A re-energised Delhi Daredevils would look for their third win in a row when they face table leaders Mumbai Indians in the Indian Premier League in New Delhi on Saturday. With back-to-back successful chases in high-scoring affairs at the Feroz Shah Kotla, Daredevils suddenly look a different side and would be aiming to build on the momentum to stay in the hunt for a play-off berth. Rishabh Pant showed last night why he is touted as the next big thing in Indian cricket as his 43-ball 97 helped Daredevils pull off the second highest chase in IPL history. Such was the quality of his innings that Sachin Tendukar called it one of the best knocks he has seen across 10 editions of the tournament. Not to forget Sanju Samson's 61 off 31 balls at the top of the order and his 143-stand with Pant that set up a famous win for Daredevils. Provided they win the toss, the home team would be backing themselves to chase another big score after mowing down targets of 209 and 186 in the last two outings at Kotla. Daredevils know they still have a tough task at hand and need to win all their remaining matches to seal a top four spot. There is still no clarity over the availability of captain Zaheer Khan, who has not played after pulling his hamstring during the match against Kolkata Knight Riders on April 28. The young Karun Nair has been captaining the side in Zaheer's absence. The stylish right-hander would want to lead by example with a defining knock after not being able to convert promising starts earlier in the competition. Daredevils host Mumbai Indians, a team that is already into the play-offs but remains focused on getting the most from its remaining league games. 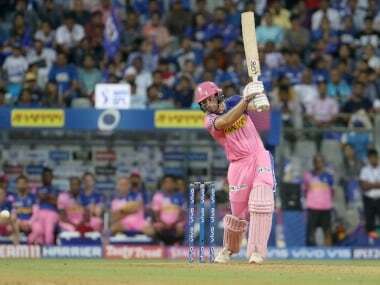 The win over Royal Challengers Bangalore in their previous game was their eighth in 10 games, reinforcing the assumption that they remain the team to beat in the competition. Captain Rohit Sharma took the team home against Virat Kohli-led side with a blazing 56, which was his second fifty plus score in three innings. Mumbai have pretty much got all their bases covered. Pacer Mitchell McClenaghan was back among the wickets again against RCB, taking his overall tally to 15 to be the team's leading wicket-taker. The one area he would want to improve on is his economy rate of 9.07 alongside the other main pacer Lasith Malinga, who has conceded almost 10 runs in an over since returning to action. Harbhajan Singh has been their most frugal bowler with the economy rate of 5.86. Delhi Dardevils: Zaheer Khan(c), Angelo Mathews, Corey Anderson, Kagiso Rabada, Pat Cummins, Ankit Bawne, Aditya Tare, Murugan Ashwin, Navdeep Saini, Shashank Singh, Mohammed Shami, Shahbaz Nadeem, Jayant Yadav, Amit Mishra, Shreyas Iyer, Sanju Samson, Chris Morris, Carlos Brathwaite, Karun Nair, Rishabh Pant, Chama Milind, Khaleel Ahmed, Pratyush Singh, Marlon Samuels. Mumbai Indians: Rohit Sharma (Captain), Lendl Simmons, Mitchel Johnsohn, Mitchell McClenghan, Nitish Rana, Parthiv Patel, Saurabh Tiwary, Shreyas Gopal, Tim Southee, Lasith Malinga, Krunal Pandya, Keiron Pollard, Ambati Rayudu, Asela Gunaratne, Harbhajan Singh, Hardik Pandya, Jagdish Suchith, Jaspreet Bumrah, Jos Buttler, Karn Sharma and Vinay Kumar.